Oh my God! To be very honest I did not expect such an enthusiastic response for my toying with the idea of a blog marathon. I had thought that I would get about 25-28 comments and I could wriggle out of it. :P No such chance! I am really overwhelmed at the really encouraging remarks I have got in my last post. So yes! I am doing it :) A new post every day for the next 30 days :) Here is my first. I list them here in no particular order. When I asked an English friend about it, he was very surprised to find that we do not have them in India. "Oh!" he exclaimed "How did you ensure the safety of your children when they were little?" he asked in amazement.
" Well, I always carried them on my hip and when they were old enough to walk I held their hands and walked them!" I replied. Here I have seen parents actually tugging this harness when the child wanders too far and I do feel a little sorry for that tiny human being at the other end of the harness, though I do know the parents have the safety of the child uppermost in their mind. But still my desi-dil cannot take it. Tomorrow: Some marvellous images from this amazing country with short notes about each. nice one!!! loved it.. first blog and a good start! i meant first blog as part of the marathon 2010! Nice to seee you start back your blog marathon... i too will do it some time. And one happy news to share, during this visit i got engaged to a sweet frind of mine "Manu"
If u want a engagement pic, check on my blog, i have added as a post. Waiting to read your next day and every other day blog marathon. Lovely post! I totally agree with you as well having lived abroad for most of my life. Keep it going!! Great start and some amazing info. It really interested me since I'm planning to move to Cardiff for my higher studies. Everything in UK sounds expensive except for one; Dubai charges rs.100+ for 2 litres milk. Stiff competition eh;-D.
I so agree with you on the second point, I believe India does need to control the road rage or this would be on of the major reasons of crime in India specially in our cities. That was a wonderful post to start the marathon...looking forward to more interesting posts all through the month. Thank you for writing, desi girl and I absolutely admire your perseverance. I could never write a marathon let alone run one! Well, I meant the marathon the other way round, you do know what I mean, right? Great post!! Had a few similar experiences during our stint in US!! Felt like reading my own mind reading your post!! Good luck with the marathon!! As always - lovely post. I can say "same here, same here" about most of the points !! The Harness for kids is so cruel na? Im glad we dont use it here. Prats: It does look liek a dog leash. But here it is like a safety precaution. Reflections: heh heh ..yeah post was meant to be light hearted only :) Glad you saw the humour :) Yes--stiff competition indeed. But I dont mind paying so much as we need not boil the milk here! In India I used to always forget and it would always overflow. :P LOL at your comment to Meira. Great start to the marathon :) You have provided a good perspective on the cultural differences. nice post... Felt the same when I was in US. As now you are on this blog marathon, I'll TRY to do a comment marathon. I might just comment in a simple smiley but I'd TRY to do it for sure. A cool desi start :). I was astounded to read about the child harness. Poor little things. Looking forward to rest of the marathon... Keep rocking!!! Child harness is a new info for me.. Have never seen that b4.. I love all your blogs. Nice post. I want to tell you something about dahi. I live in Michigan, USA where we have cold winters, temperature even dipping to negative Fahrenheits. Still we can make dahi at home. Boil or at least warm up milk well. Let it cool down to a lukewarm temperature, add 2 spoons of starter yogurt and mix well. I use a churn to mix it well. Then put it in the oven with the oven light on overnight. And lo, in the morning you have home made dahi! The number of hours you have to keep it depends on the weather. In summer, you can still do the same, but you need to keep in oven only for about 5 hours. Try it and let me know. Cheers! Nice one.......... i liked it...bt the last lines r my favourite...........tht is " phir bhi dil hai hindustani......"
its ..same as in US..but if we compare to India..yup..its different... nice post! Liked this post a lot and seriously was shocked by the child harness thingy - that was way too much! 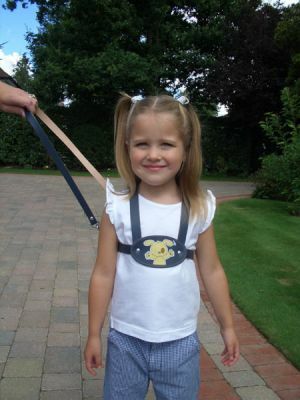 Child harness! I never heard of such a thing, even in the US. It's a little upsetting. And hazelnut yogurt! That would be yummy. I've seen tons of flavors here but no hazelnut.